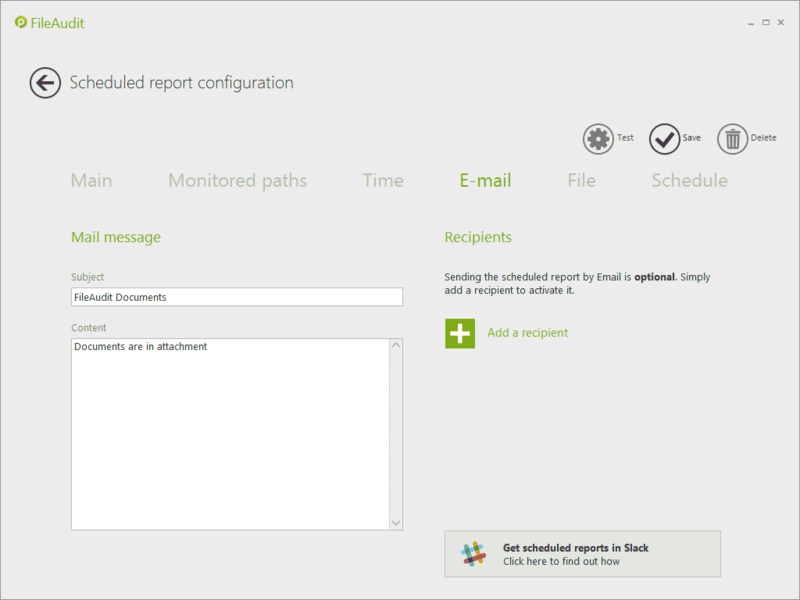 The “E-mail” tab allows you to define the e-mail message and recipients for this scheduled report. The content of the e-mail message can be personalized. You can modify the ‘Subject’ and ‘Mail’ templates as desired. All previously-defined recipients of scheduled reports or alerts are stored as general parameters by FileAudit, allowing you to select existing recipients from this list. Alternatively, new recipients can be added. The stored information for this contact (name, e-mail address) will be displayed on the right panel and can be modified if needed. If your organization is using Slack, you may be interested in receiving your FileAudit scheduled reports directly on Slack. Go to this page to see how to configure this.